The Amur basin. Nerchinsk is part way up the Shilka. The Stanovoy Range extends along the northern edge of the Amur basin. The agreement was signed in Nerchinsk on August 27, 1689. The signatories were Songgotu on behalf of the Kangxi Emperor and Fyodor Golovin on behalf of the Russian tsars Peter I and Ivan V.
The authoritative version was in Latin, with translations into Russian and Manchu, but these versions differed considerably. There was no official Chinese text for another two centuries, but the border markers were inscribed in Chinese along with Manchu, Russian and Latin. Later, in 1727, the Treaty of Kiakhta fixed what is now the border of Mongolia west of the Argun and opened up the caravan trade. In 1858 (Treaty of Aigun) Russia annexed the land north of the Amur and in 1860 (Treaty of Beijing) took the coast down to Vladivostok. The current border runs along the Argun, Amur and Ussuri Rivers. The northern border of "Chinese Tartary", as shown on this map from 1734, was more or less the Sino-Russian border line settled at Nerchinsk. Nerchinsk itself is shown on the map (on the Russian side of the border) as well. From about 1640, Russians entered the Amur basin from the north, into land claimed by the Manchus who at this time were just beginning their conquest of China. The Manchus had, by the 1680s, completed the conquest of China and eliminated the last Ming successor states in the south. With the Manchu Qing dynasty now firmly in control of the South, it was in a position to deal with what they saw as Russian encroachment in Manchuria, the dynasty's ancient homeland. By 1685 most of the Russians had been driven out of the area. See Sino–Russian border conflicts for details. After their first victory at Albazin in 1685, the Qing government sent two letters to the Tsar (in Latin) suggesting peace and demanding that Russian freebooters leave the Amur. The Russian government, knowing that the Amur could not be defended and being more concerned with events in the west, sent Fyodor Golovin east as plenipotentiary. Golovin left Moscow in January 1686 with 500 streltsy and reached Selenginsk near Lake Baikal in October 1687, from whence he sent couriers ahead. It was agreed the meeting would be in Selenginsk in 1688. At this point the Oirats (western Mongols) under Galdan attacked the eastern Mongols in the area between Selenginsk and Peking and negotiations had to be delayed. To avoid the fighting Golovin moved east to Nerchinsk where it was agreed that talks would take place. The Manchus with 3,000 to 15,000 soldiers under Songgotu left Peking on June 1689 and arrived in July. Talks went on from August 22 to September 6. The language used was Latin, the translators being, for the Russians, a Pole named Andrei Bielobocki and for the Chinese the Jesuits Jean-Francois Gerbillon and Thomas Pereira. To avoid problems of precedence, tents were erected side by side so that neither side would be seen as visiting the other. G. P. March remarks that there were no mandarins with them, even though two Han mandarins were originally assigned to Selenginsk negotiations, but since the venue was changed to Nerchinsk, the journey had to be made on horseback and few Han gentlemen had mastered this undignified skill. However, there was little need for Han mandarins, just as there was no need for an immediate Chinese translation. Both Manchu and Chinese were the official languages of the Qing court and both continued to be official languages into the eighteenth century. Dulimbai Gurun is the Manchu name for China (中國, Zhongguo; "Middle Kingdom"). In the Treaty of Nerchinsk the name "China" (Dulimbai Gurun, Zhongguo), was used to refer to the Qing territory in Manchuria in both the Manchu and Chinese language versions of the treaty, and the term "the wise Emperor of China" was also referred to in the text of the treaty in Manchu; the term "Chinese language" (dulimbai gurun i bithe) which appeared in the Manchu text of the Treaty referred to Chinese, Manchu, and Mongol languages, which were to be used to inscribe the Treaty on a monument serving as a border marker. Perhaps more significantly, Russian acceptance of the treaty required a relaxation of what had been, in Ming (the former dynasty) times, an iron rule of Chinese diplomacy, requiring the non-Chinese party to accept language which characterized the foreigner as an inferior or tributary. The conspicuous absence of such linguistic gamesmanship from the Treaty of Nerchinsk, together with the equally conspicuous absence of Chinese language or personnel, suggests that the Kangxi emperor was using the Manchu language as a deliberate end-run around his more conservative Han bureaucracy. This was a tactic regularly used by early Qing emperors in matters which were particularly delicate or confidential. The Yuan Empire's rule of Mongol tribes living around Lake Baikal was claimed by the Qing, who incited the defection of the Nerchinsk Onggut and Buryat Mongols away from the Russians. The Manchus wished to remove the Russians from the Amur. 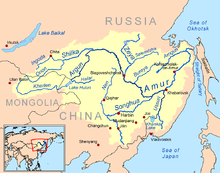 They were interested in the Amur since it was the northern border of the original Manchu heartland. They could ignore the area west of the Argun since it was then controlled by the Oirats. The Kangxi Emperor (i.e. the reigning Qing (Manchu) dynasty emperor of China) also wished to settle with Russia in order to free his hands to deal with the Zunghar (= Dzungar, Junghar, etc.) Mongols of Central Asia, to his northwest. The Manchus also wanted a delineated frontier to keep nomads and outlaws from fleeing across the border. The Russians, for their part, knew that the Amur was indefensible and were more interested in establishing profitable trade, which the Kangxi Emperor had threatened to block unless the border dispute were resolved. Golovin accepted the loss of the Amur in exchange for possession of Trans-Baikalia and access to Chinese markets for Russian traders. The Russians were also concerned with the military strength of the Manchus, who had demonstrated their capability, in 1685 and 1686, by twice overrunning the Russian outpost at Albazin. The Crimean Tatars were defeating the Russians and the Qing's enemies, while the Dzungars under Galdan were seizing Mongolia, so both the Russians and Qing were eager to end the conflict. The agreed boundary was the Argun River north to its confluence with the Shilka River, up the Shilka to the "Gorbitsa River", up the Gorbitsa to its headwaters, then along the east-west watershed through the Stanovoy Mountains and down the Uda River (Khabarovsk Krai) to the Sea of Okhotsk at its southwest corner. The border west of the Argun was not defined (at the time, this area was controlled by the Oirats). Neither side had very exact knowledge of the course of the Uda River. The Gorbitsa is hard to find on modern maps. Ravenstein, writing in 1861, suggested that there are two Gorbitsa Rivers. He thought that the lower Gorbitsa is the modern Amazar which enters the Amur about 25 miles downstream from the Argun-Shilka junction and that the upper Gorbitsa is the modern Chernaya which enters the Shilka about 100 miles upstream from the junction. He thought that the Amazar is almost certainly the real Gorbitsa. He then repeats a tale to the effect that about 1710 a Tungus deserted to the Russian side of the border. He evaded being sent back by claiming the upper Gorbitza was the real border. The Chinese were happy with this and moved the boundary stone. The treaty had six paragraphs: 1 and 2: definition of the border, 3. Albazin to be abandoned and destroyed. 4. Refugees who arrived before the treaty to stay, those arriving after the treaty to be sent back. 5. Trade to be allowed with proper documents. 6. Boundary stones to be erected, and general exhortations to avoid conflict. Russian interest in the Amur was revived in the 1750s. In 1757 Fedor Ivanovich Soimonov was sent to map the area. He mapped the Shilka, which was partly in Chinese territory, but was turned back when he reached its confluence with the Argun. In 1757 Vasili Fedorovich Bradishchev was sent to Peking to investigate the possibility of using the Amur. He was received cordially and given a definite no. After that the matter was dropped. In 1799, when Adam Johann von Krusenstern visited Canton he saw an English ship that had brought furs from Russian America in five months as opposed to the two years or more for the Okhotsk–Yakutsk–Kyakhta route. He saw that this could replace the overland trade. He submitted a memoir to the Naval Ministry which led to his command of the first Russian circumnavigation. He was able to sell American furs at Canton after some official resistance. Only when he returned to Kronstadt did he learn that his presence in Canton had provoked an edict making clear that Russian trade with the Middle Kingdom would be confined to Kyakhta. For the rest see Treaty of Kyakhta and Amur Acquisition. ^ Krausse, Alexis Sidney (1899). Russia in Asia: a record and a study, 1558-1899. G. Richards. pp. 330–31. Retrieved 26 August 2011. ^ On the difference between version of the treaty, see V. S. Frank, "The Territorial Terms of the Sino-Russian Treaty of Nerchinsk, 1689", The Pacific Historical Review 16, No. 3 (August 1947), 265–170. For the original texts of the treaties, see Michael Weiers ed., Die Verträge zwischen Russland und China, 1689-1881 (Bonn: Wehling, 1979). ^ Journal of the Royal Central Asian Society, 281. ^ Elman, Benjamin A (2007), Ming-Qing border defense, the inward turn of Chinese Cartography, and Qing expansion in Central Asia in the Eighteenth Century, in Diana Lary (ed.) Chinese State at the Borders. Univ. Wash. Press, pp. 29–56. [Ellman (2007: 47)]. ^ Smith, Richard J (1994), China's Cultural Heritage: The Qing Dynasty, 1644-1912 (2nd ed.). Westview Press. pp. 101-102. ^ Zhao (2006), pp. 8 and 12. ^ Fairbank, John K (1986), The Great Chinese Revolution: 1800-1985. Harper & Row, pp. 36-37. ^ Peter C Perdue (30 June 2009). China Marches West: The Qing Conquest of Central Eurasia. Harvard University Press. pp. 167–169. ISBN 978-0-674-04202-5. ^ Perdue, Peter C (1996), "Military mobilization in Seventeenth and Eighteenth-Century China, Russia, and Mongolia". Mod. Asian Stud. 30: 757-793, 763-764. ^ Gang Zhao (2006), "Reinventing China: Imperial Qing ideology and the rise of modern Chinese national identity in the early Twentieth Century". Mod. China 32: 3-30, 14. ^ Black, Jeremy (1999), War in the Early Modern World: 1450-1815. UCL Press., p. 98. ^ Christopher I. Beckwith (16 March 2009). Empires of the Silk Road: A History of Central Eurasia from the Bronze Age to the Present. Princeton University Press. pp. 235–. ISBN 1-4008-2994-1. Hauer, Erich (2007). Corff, Oliver (ed.). Handwörterbuch der Mandschusprache. Volume 12; Volume 15 of Darstellungen aus dem Gebiete der nichtchristlichen Religionsgeschichte (illustrated ed.). Otto Harrassowitz Verlag. ISBN 3447055286. Retrieved 10 March 2014. Vincent Chen. Sino Russian Relations in the Seventeenth Century. (The Hague: Martinus Nijhoff, 1966). V. S. Frank. "The Territorial Terms of the Sino-Russian Treaty of Nerchinsk, 1689". The Pacific Historical Review (August 1947): 265-170. Mancall, Mark. Russia and China: Their Diplomatic Relations to 1728. Cambridge, Massachusetts: Harvard University Press, 1971. Perdue, Peter C. China Marches West: The Qing Conquest of Central Eurasia. Cambridge, Massachusetts: Belknap Press of Harvard University Press, 2005. Sebes, Joseph, and Thomas Pereira. The Jesuits and the Sino-Russian Treaty of Nerchinsk (1689): The Diary of Thomas Pereira. Bibliotheca Instituti Historici S.I. ; V. 18. Rome: Institutum Historicum S.I., 1962. Zhao, Gang (January 2006), "Reinventing China Imperial Qing Ideology and the Rise of Modern Chinese National Identity in the Early Twentieth Century", Modern China, 32 (1): 3–30, doi:10.1177/0097700405282349, JSTOR 20062627, archived from the original on 2014-04-20. This page was last edited on 15 February 2019, at 03:03 (UTC).